Paul Casey claimed the Irish Open title after a fantastic five-under-par final round of 67 earned him a three-shot victory. 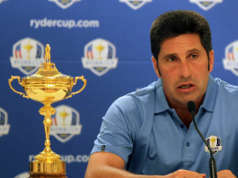 Jose Maria Olazabal finished joint fifth. Beginning the day in joint fourth, Casey showed the form which had once catapulted him to third in the world rankings, as he mastered the difficult conditions to secure the win at Carton House after a round which included an eagle on the 18th. Overnight leader Joost Luiten endured a disappointing day as he could only record a final round of 74, as he finished tied for second with Robert Rock on 11-under par. Pablo Larrazabal claimed fourth after a 75 saw him enter the clubhouse on nine-under, while legendary Spaniard Jose Maria Olazabal finished one shot behind on eight-under as he finished joint fifth after a 72. Speaking afterwards, Casey said his first victory in over two years was a great moment. "It's incredibly sweet," he said. "It's been a while and when that putt went in (at the 18th hole) half of it was relief and half of it was satisfaction. "What a grandstand finish - winning an Irish Open is an absolute dream. "It was a shaky start, I didn't hit the ball particularly close going out but when the putts did start to go in I got on a bit of a roll." All eyes will turn to Muirfield shortly as the world's best players travel to Scotland to contest The Open. Casey is rated as 1/1 to claim the win outright, with Tiger Woods available at 1/1.